This is an official Officers Badge and authorized release of an authentic police badge for the Pelican Bay police department. A beautiful piece of law enforcment equipment, popular for the police badge collector. ► Edition size of only 200, limited quantities available. COA2Every 'Collector Badge' certificate of authenticity is hand signed by the head of the issuing agency. This certificate is your guarantee from the law enforcement agency that the badge is legitimate Department Issue. It also gives you the valuable signed written permission necessary to possess the badge you purchase. Every badge is done in very small limited edition only and serial numbered. Specific restrictions and conditions may be set by the Department Heads which are printed on the Certificates of authenticity granted by the Agency. 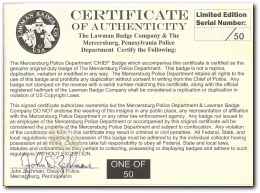 The hand signed original certificate (no copying allowed) authorizes the badge collector to own and retain the Department Badge in their collection. Don't miss out on this rare offer and opportunity to add a very high quality Department issue (Original Equipment) badge to your collection. All badges come with documentation from the agency itself. Get them while they last .